fenbacher, 1980; Hembree, 1988; Liebert & Morris, 1967). mant (i.e., student, parent, teacher)? one of each student’s legal guardians, and one of their teachers. determined for parents and teachers. of student time during school hours was eliminated. 1. I am confident about my performance. 2. I think about how important the examination is for me. 4. I think about my abilities. 5. Distracting thoughts keep “popping” into my head. 6. I worry about whether I can cope with being examined. 8. I have faith in my own performance. 9. I am thinking about the consequences of failing. 10. I ask myself whether my performance will be good enough. 11. I am preoccupied by other thoughts which distract me. 13. I know that I can rely on myself. 14. I think about how important it is for me to receive a good result. 15. I easily lose my train of thoughts. 17. I worry about my results. 20. I am satisfied with myself. 21. I am concerned about my grades. 22. I tremble with fear. 23. I worry that something might go wrong. 24. My concentration is interrupted by interfering thoughts. 26. I think that I will succeed. 27. I think about what will happen if I don’t do well. 29. I am convinced that I will do well. 30. I have the feeling everything is so difficult for me. vided by V. Hodapp through email correspondence). 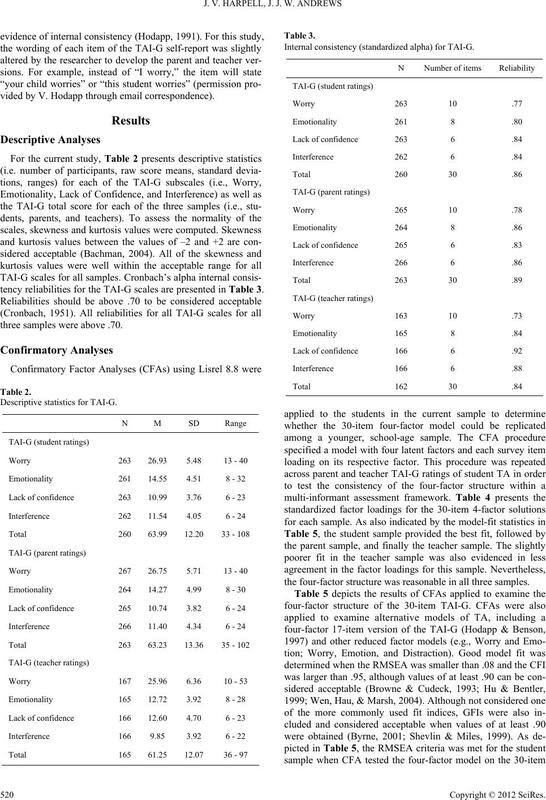 tency reliabilities for the TAI-G scales are presented in Table 3.
three samples were above .70. 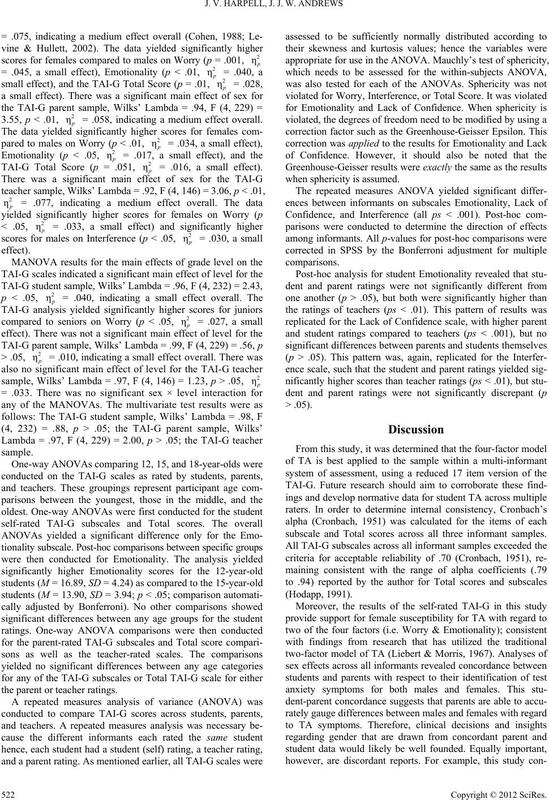 Internal consistency (standardized alpha) for TAI-G.
the four-factor structure was reasonable in all three samples. Students (N = 260), Parents (N = 263), Teachers (N = 162). 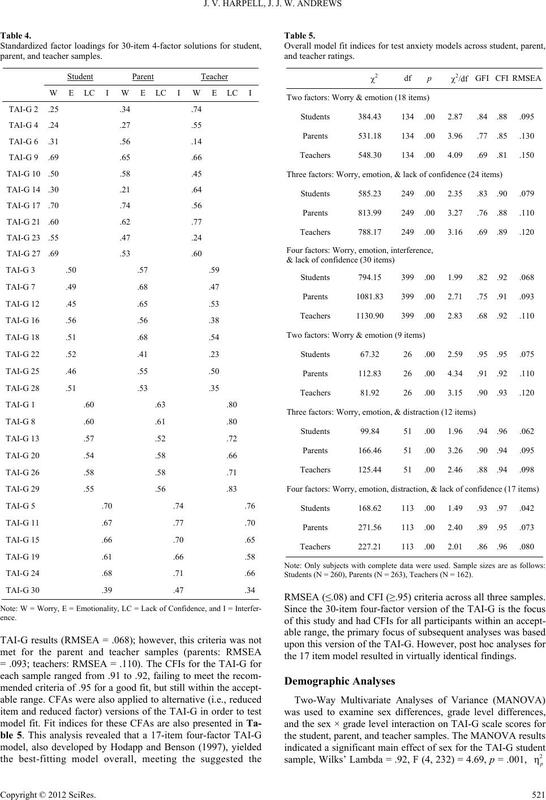 RMSEA (≤.08) and CFI (≥.95) criteria across all three samples. the 17 item model resulted in virtually identical findings. = .058, indicating a medium effect overall. = .016, a small effect). the parent or teacher ratings. subscale and Total scores across all three informant samples. avoidance, and resistance relative to their ratings. 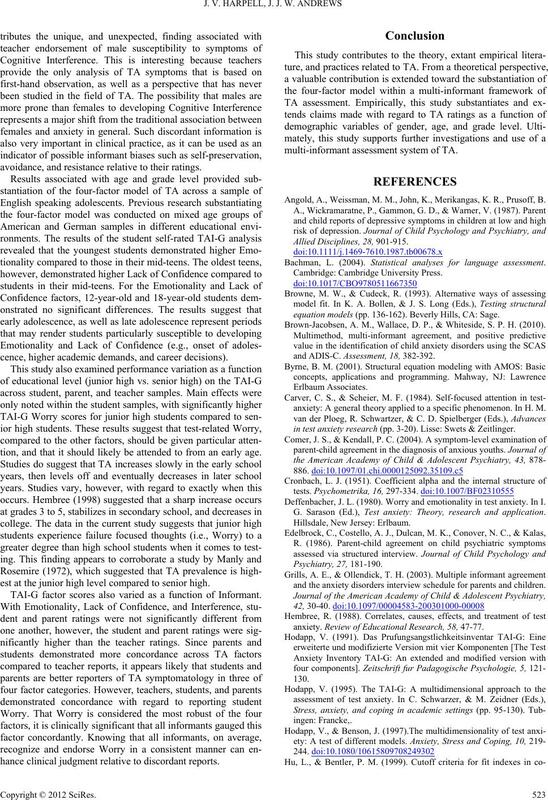 cence, higher academic demands, and career decisions). tion, and that it should likely be attended to from an early age. est at the junior high level compared to senior high. TAI-G factor scores also varied as a function of Informant. hance clinical judgment relative to discordant reports. multi-informant assessment system of TA. Angold, A., Weissman, M. M., John, K., Merikangas, K. R., Prusoff, B.
Bachman, L. (2004). Statistical analyses for language assessment. equation models (pp. 136-162). Beverly Hills, CA: Sage. Brown-Jacobsen, A. M., Wallace, D. P., & Whiteside, S. P. H. (2010). and ADIS-C. Assessment, 18, 382-392.
anxiety: A general theory applied to a specific phenomenon. 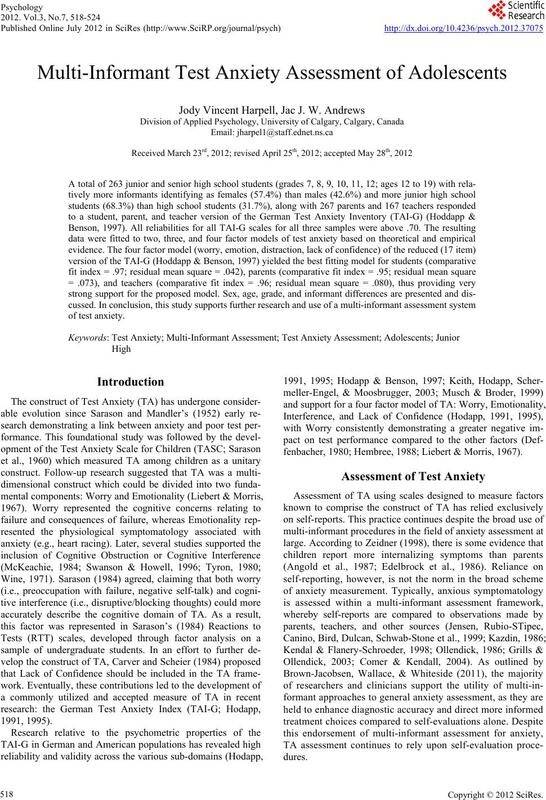 In H. M.
in test anxiety research (pp. 3-20). Lisse: Swets & Zeitlinger. Deffenbacher, J. L. (1980). Worry and emotionality in test anxiety. In I.
G. Sarason (Ed. ), Test anxiety: Theory, research and application. and the anxiety disorders interview schedule for parents and children. anxiety. Review of Educational Research, 58, 47-77.
tives. Structural Equation Modeling, 6, 1-55.
diagnosis of mental disorder: Are both informants always necessary? Jewish Family Services (2004). Family front and centre: Anxiety. Keith, N., Hodapp, V., Schermelleh-Engel, K., & Moosbrugger, H.
Stress, and Coping, 16, 251-270. American Academy of Child and Adolescent Psychiatry, 40, 787-794. 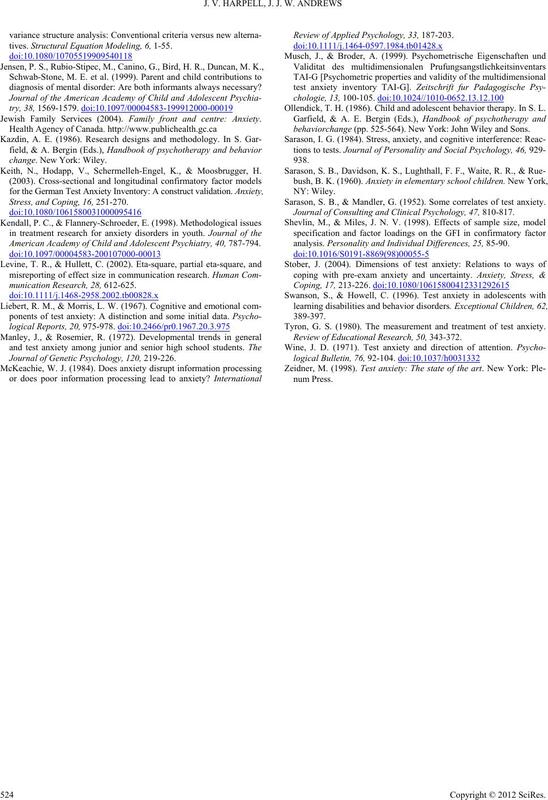 Journal of Genetic Psychology, 120 , 219-226.
Review of Applied Psychology, 33, 187-203. Ollendick, T. H. (1986). Child and adolescent behavior therapy. In S. L.
behaviorchange (pp. 525-564). New York: John Wiley and Sons. Sarason, S. B., & Mandler, G. (1952). Some correlates of test anxiety. Journal of Consulting and Clin ic al Psychology, 47, 810-817.
analysis. Personality and Individual Differences, 25, 85-90. Tyron, G. S. (1980). The measurement and treatment of test anxiety. Review of Educational Research, 50 , 343-372.